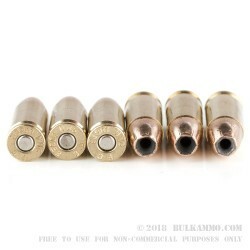 This is a fairly priced, jacketed hollow point 9x19 round that offers great ballistics from a major maker with a very good set of performance figures. 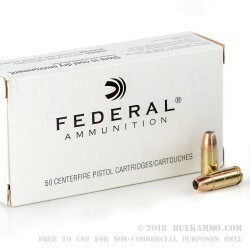 The Federal Hi-shok ammunition is a 147 grain jacketed hollow point projectile with a clean powder charge behind it in a brass case with a Boxer primer. 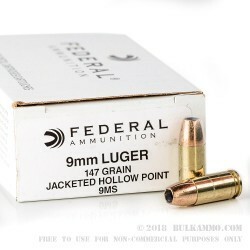 This is a value priced 9mm Luger load that offers a good price so you can justify stockpiling some of it, knowing that you can run bulk JHP ammo if you needed to and won’t feel too bad about it. Federal is among the best producers of ammunition in the United States; by volume it is one of the top producers in the world. It holds numerous major law enforcement and military ammunition contracts and the protocols for quality control at the factories is second to none. 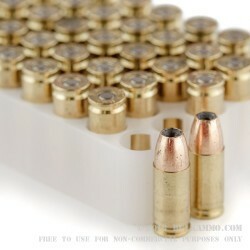 The type of reliability that made Federal famous is a pipe dream for most of the competitors that attempt to compete in small batches with this non-descript white box of 9mm that achieves 1000 feet per second velocity and 326 ft. lbs. of energy at the muzzle.